This in-depth course is a comprehensive tattoo/cosmetic tattoo/permanent makeup/body artist specific accredited IBMS Tattoo Course on Blood-Borne Pathogens and Communicable Diseases. A certificate of completion documenting (70%) passage of the accredited IBMS Course on Blood-Borne Pathogens and Communicable Diseases will be provided to the tattoo/cosmetic tattoo/permanent makeup artist. The following is a detailed description of the course content specific to the tattoo/cosmetic tattoo/permanent makeup/body art industry excluding the examination. States accepting OSHA compliant course/Florida accredited course are APPROVED. Recognized by State of California Department of Public Health as a Continuing Education Accreditation Agency for Registered Environmental Health Specialists. (REHS). 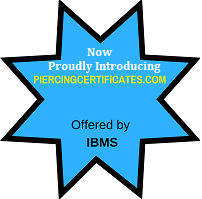 By passing the IBMS online industry specific course on Blood-borne Pathogens and Communicable Diseases, you'll receive the passage certificate required for state licensure or registration and/or annual renewal of licensure or registration of body artists, including tattoo artists, cosmetic tattoo artists, permanent makeup artists and piercers. Then kick your credentials up a notch by becoming an IBMS certified member of the International Board of Medicine and Surgery. SUPPLIES & EQUIPMENT …"BEST QUALITY at the BEST PRICES for IBMS Certified Members"
License to use IBMS certification mark on your advertising and marketing materials. Real-time validation that you are a member in good standing. Drives traffic to your website with hard links, helping to increase your Google Page Rank. Prospective customers can search IBMS membership list to find you. Internationally recognized standard of excellence adds prestige to your practice. IBMS Body Art (Tattoo) Certification .... FREE Online Course Discusses State Laws, Potential Medical and Legal Complications ..... become certified by the International Board of Medicine and Surgery (IBMS) .... Take IBMS Body Art Certification Exam (20 questions) only $195 with option for annual renewal/maintenance of certification.